Equipo Nizkor - What Is Vitézi Rend, The Ally Of The Nazis That Sebastian Gorka 'Joined'. What is the Vitézi Rend and how did Sebastian Gorka purportedly join it? The Hungarian group was established as a loyalist group by Admiral Miklos Horthy, who ruled Hungary as a staunch nationalist from 1920 to October 1944. A self-confessed anti-Semite, Horthy imposed restrictive Jewish laws prior to World War II and collaborated with Hitler. His cooperation with the Nazi regime included the deportation of hundreds of thousands of Jews into Nazi hands. The group's mission emphasized not only loyalty to Hungary and nationalist ideas, but also an ideology of racial superiority. One of the original aims of the Vitézi Rend was to "ensure such might to the Hungarian race, which with tremendous power strikes every subversive state and anti-national movement," Horthy said in a speech to new members in 1921. 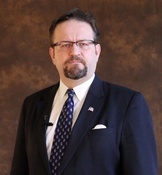 The Quisling group to which Gorka, 46, purportedly belongs is a reconstitution of the original group on the State Department list, which was banned in Hungary until the fall of Communism in 1989. His association with the group first arose when he was spotted wearing a medal issued by the group. He claimed he wore it as a tribute to his father.